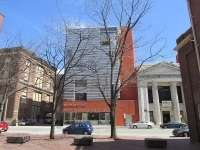 The small but comprehensive museum attached to the Rhode Island School of Design features many changing exhibitions, particularly relating to textiles. The museum's permanent collection includes the Abby Aldrich Rockefeller collection of Japanese prints, Chinese terracotta, Greek statuary, and some French Impressionist paintings. Highlights are works by masters such as Monet, Cézanne, Rodin, and Picasso. There is also an American section containing paintings by Gilbert Stuart, John Singleton Copley, and John Singer Sargent. Please note that there are two entrances to the museum, the Museum's Benefit Street entrance and the Chace Center entrance at 20 North Main Street. Opening times: Tuesday to Sunday 10am-5pm, closes 9pm on the third Thursday of the month. Admission: $15 adults, free for youths 5-18. Free admission on Sundays from 10am to 5pm, and the third Thursday of every month between 5pm and 9pm.